Ablaze is a charity that helps Bristol businesses provide opportunities for volunteers to share their business skills to raise aspirations, attainment and achievement in young people – particularly those from disadvantaged areas. Ablaze was looking for female business volunteers to act as positive role models to deliver 'Breaking Limits', an innovative programme for teenage girls who may under-perform at GCSE level, at Oasis John Williams Academy Bristol. Harriet Stevens from HMRC Corporate Communications - Sustainability team volunteered to run a session, and shares her experiences. “I was inspired by the concept of the programme and volunteered to design and deliver an interactive session at my office, rather than in school, so the girls would have the chance to visit, and be welcomed into, a workplace. I invited two colleagues, both recent HMRC graduate recruits, Holly Winter and Lauren Hayden to work with me, figuring that my experience in HMRC and their youth and recent experience of the job market might be an effective combination. On the 11 November, nine girls arrived with their teacher. I ran an ice-breaker session to help everyone get to know each other a little and to relax in what, for the girls, was a totally unfamiliar environment. I then spoke briefly about what HMRC is and what we do. Holly spoke about how her own education journey had had its ups and downs. She said that even if the girls, like her at their age, had no idea what job they wanted to do after school, they should still aim for good GCSEs. This message, coming as it did from a young person who has only recently embarked on their career, had a strong impact on some of the girls. I then split the group into 2 and asked each to plan a charity fundraising campaign and a poster to accompany it, which they then presented to the other group. This enabled the girls to practice team working, influencing and planning skills and also to think about how they would bank and report money raised through charitable fundraising activity. Ablaze’s Breaking Limits coordinator Amanda Cranston also attended on the day said we had done a brilliant job, and that Holly and Lauren were an inspiration to the girls. I asked the girls to complete a very simple questionnaire at the end and all answers were positive. The most encouraging answer to the question ‘What new thing did you learn today?’ was ‘that even though I don’t know what to do now, [I should] still work hard because it will help in future’. I’ve done a fair bit of facilitating and coaching of adults over the years but knew I needed to think a little differently to engage a young audience which has sometimes switched off from learning. 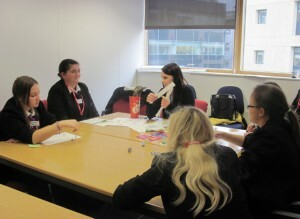 I sought and took on board the advice of Ablaze and the girls’ teacher and made the session as interactive as possible. I gave a 5 minute introductory talk about HMRC but there were no other periods where the girls had to sit and passively receive information, as this could have been a turn-off. They really enjoyed being part of small groups and working together on a short project, with an outcome that they could report back and discuss with their peers."